As a reform Jew married to a fallen Catholic with a daughter who identifies herself as Jewish, all within a family structure that honors the traditions of both sides of the family, I stand in an interesting – if not unique – position to evaluate the comparisons and contrasts between Hanukkah and Christmas. While the nightly lighting of the Menorah candles has a resonating, ritualistic appeal, the simple fact is that Christmas tends to win many, if not most of the comparisons. “Dreidel, Dreidel, Dreidel” and “Chanukah, Oh Chanukah” do not – pardon the pun – hold a candle to the vast and varied world of Christmas music of nearly every stripe. Hanukkah food also is frequently compared unfavorably to its Christmas counterparts. Judaism has no clear answer to the Sicilian Feast of the Seven Fishes or Polish Vigilia, amongst many notable examples. But Hannukah foods have their own charms. 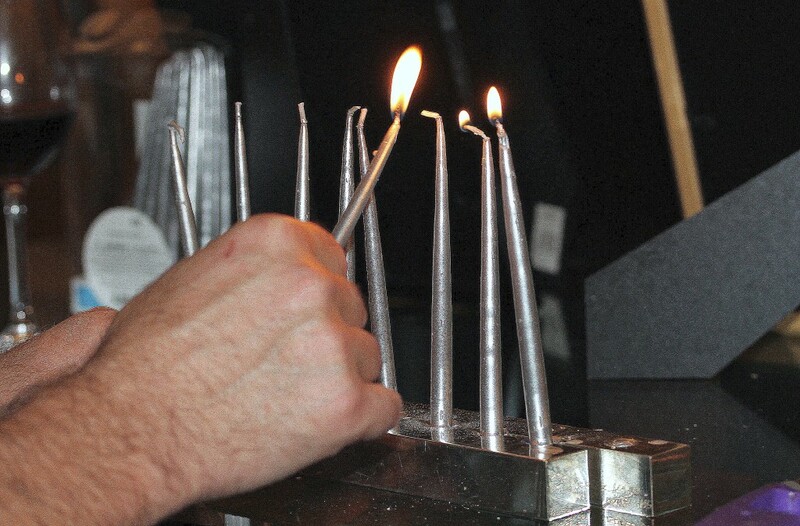 In a nod to the foundational myth of Hanukkah – returning to the Temple of Jerusalem following a victorious Jewish revolt against Antiochus, the Maccabees found only enough olive oil to light the Temple’s oil lamps for a day…and yet it burned for eight days (long enough to prepare a fresh batch) – Hannukkah dishes tend to be fried in oil. This makes for rich and tasty – if heavy – fare. The signature classic Hanukkah dish is called “Latkes” in Yiddish (“Levivot” is the Hebrew word), shallow-fried pancakes of grated or ground potato, flour (matzoh flour is common) and egg, often flavored with grated onion or garlic and seasoning. 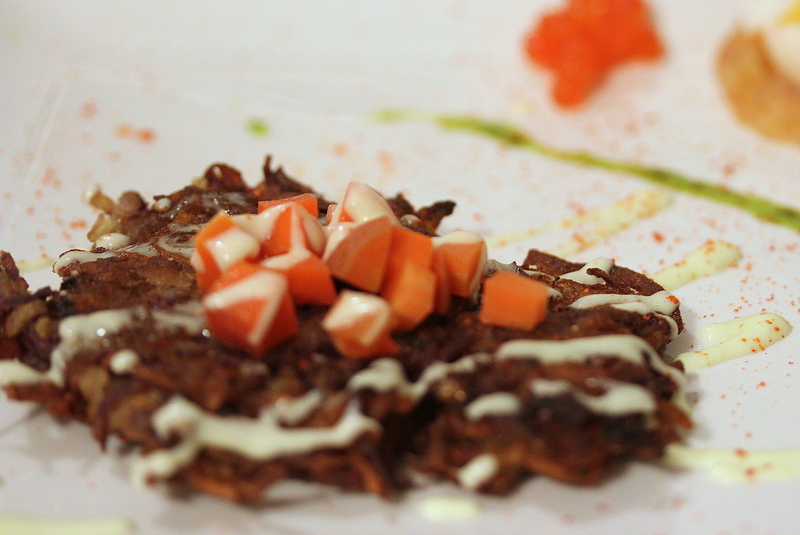 Traditional toppings for latkes are sour cream (on the savory side) or apple sauce (on the sweet side). While latkes are always the highlight of the Hanukkah meal for me, I could not help but wonder if there was a way to elevate them just a bit. To do so I decided to riff off the classic combination of potatoes and eggs. It is a combination readily recognizable from, for example, the classic Spanish Tortilla Española or American Corned Beef Hash. I decided to use three types of eggs – chicken, fish and sea urchin roe (ok, uni – is not actually an egg, but it is clearly related and frequently mis-described as such) and three types of potatoes – Russet, Yukon Gold and Japanese Purple (ok, actually a yam), and tied it all together with a Wasabi Cream and various garnishes. The three types of potato yield a latke that is flavorful in and of itself, not just based on the carmelization of the fry and the garnishes and toppings served with it. 1. Pickle the Carrots. One to two days before you are going to be serving the dish, blanch carrots in a 4-quart nonreactive saucepan of boiling salted water 1 minute, then drain in a colander and rinse under cold water to stop cooking. Transfer carrots to a heatproof bowl. Bring remaining ingredients to a boil in saucepan, then reduce heat and simmer 2 minutes. Pour pickling liquid over carrots and cool, uncovered. Chill carrots, covered, at least 1 day for flavors to develop. 2. Poach the Eggs.If using a sous vide (which I recomment), pre-heat the water bath to 143.5° Fahrenheit. Place the eggs into the sous vide bath and cook for 45 to 60 minutes. Meanwhile, toward the end of the cooking time bring a small pot of water to a boil. Remove the eggs from the water bath and place the eggs directly in the boiling water for 3 to 5 minutes to firm up the egg whites just a bit. The poaching process can, of coruse, be done by traditional methods, but I find the result of sous-vide poached eggs more dependable and — frankly — easier. 3. Prepare the Latke Mixture. Grate the potatoes and onions together into a mixing bowl. Drain off the excess liquid produced by the grating process. Add the eggs to the mixture and beat until it is just blended. Mix and sift the flour, salt, peppers and baking powder and stir into the Latke Mixture, mixing well. 4. Fry the Latkes. Heat enough oil in a large heavy skillet so that it is at least ½ an inch deep. When hot (about 375° Fahrenheit) drop a heaping tablespoon of the batter into the fat and flatten and spread it out with the back end of the spoon. 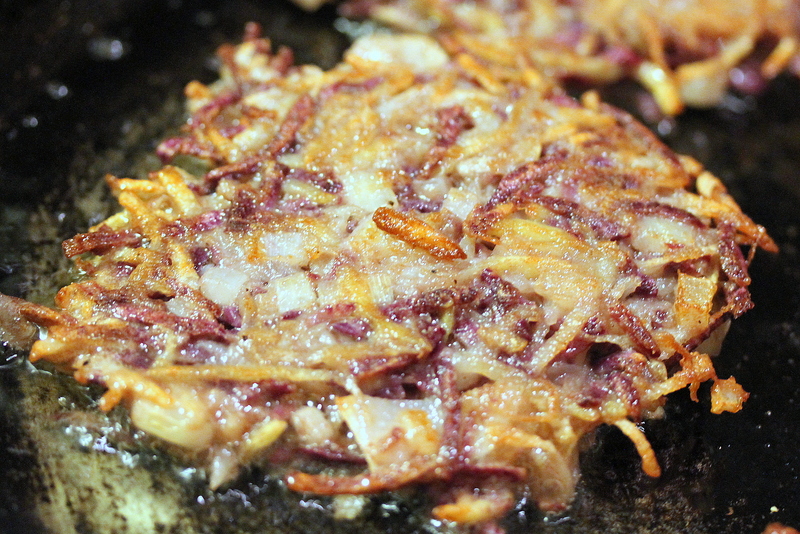 Repeat to fill the pan leaving enough room around each latke so that they do not crowd each other. 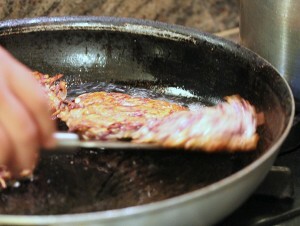 When the beautiful brown color begins to just creep around the top of the latke flip it and fry the other side. This will prepare more latkes then you will need for the dish. Worry not, there must be a kid on your block who will enjoy the extras with a little applesauce. 5. Prepare the Wasabi Creme Fraiche. Place the Creme Fraiche and Wasabi in a mixing bowl and whisk to combine. Add the mirin and mix well. Pour the Wasabi Creme Fraiche into a squeeze bottle. 6. Assemble the Dish. Finely dice enough of the pickled carrots to yield one cup of diced carrots. Make a small circle at one end of each plate using the strips of gravlax. Place a poached egg in the platform created by the gravlax circle. Place one latke on the other side of each plate. Top it with a tablespoon or so full of pickled carrots. Drape a tongue of the uni over the poached egg and add a teaspoon of caviar on either side of the egg. Drizzle the Wasabi Creme Fraiche over and all around the plate. Garnish with the chive oil and red pepper powder.